More and more Londoners believe that tackling air pollution should be a priority, new polling data shows, with a greater proportion of respondents saying that air quality affects the daily decisions they make. The data was released as part of Clean Air Day 2018, a nation-wide awareness raising campaign co-ordinated by Global Action Plan. In a third year of polling research commissioned by London Councils to gauge the public’s understanding of air quality and the effect it can have on their lives, the number of respondents who felt that their health had been impacted by London’s air pollution has risen to over half (53 per cent), compared to 47 per cent in 2017. Of those respondents, over two-thirds (67 per cent) said that they had suffered symptoms from poor air quality, including breathing difficulties and asthma gettign worse. This figure has increased by 13 per cent compared to 2016's ffigures. 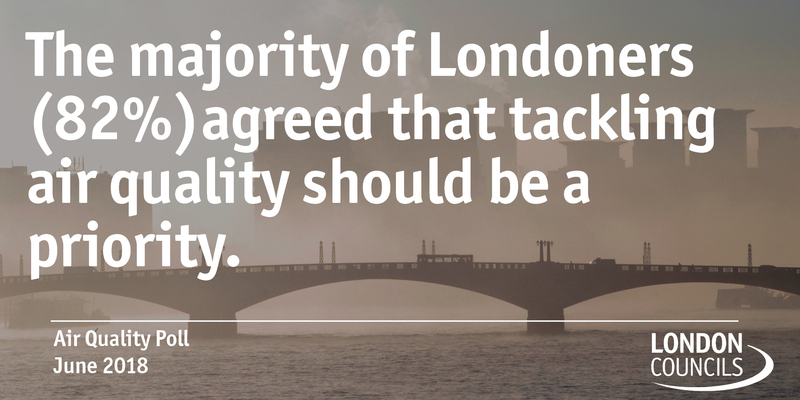 39 per cent of respondents felt that London's air had got worse in the last 12 months. General awareness of air quality issues has increased each year since 2016; with 91 per cent of all respondents this year saying they felt they were aware of air quality as an issue. This is compared to 88 per cent in 2017 and 83 per cent in 2016. Over half of people (52 per cent) said air quality impacted on decisions they made regarding their health, compared to 47 per cent in 2017 and 39 per cent in 2016. Two thirds of all parents in London (60 per cent) say air quality affects their choice of school for their children; this is compared to 50 per cent in 2017. Nearly half of those questioned (47 per cent) say air quality affects where they choose to live in London, compared to 42 per cent in 2017 and 38 per cent in 2016. When asked what would encourage them to buy an electric vehicle (EV) Londoners surveyed pointed to improved tax incentives (21 per cent), environmental considerations (22 per cent), better charging infrastructure (17 per cent) and improved Government funding grants (17 per cent) as the main things. 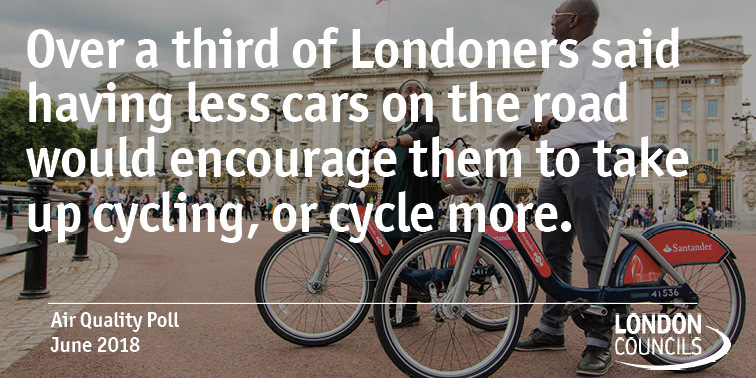 35 per cent of people in the survey said that they cycled in London, compared to 29 per cent in 2016. When asked where they thought they were most exposed to poor air quality, while 57% believed you were most exposed walking along a busy road, interestingly 49% of people asked thought that you were least exposed whilst in a car. “This data drives home the fact that Londoners are becoming more aware of the effects of air pollution and that it is having a bigger impact on our communities. A growing number of Londoners want more to be done to tackle this issue as pollution continues to worsen their health and restrict the choices people make. “London boroughs are on the frontline of addressing the capital’s pollution problem. We work hard to incentivise walking and cycling, expand the network of electric vehicle charging infrastructure and engage with the public on how they can reduce their air pollution impacts. Accelerate shift to zero emissions transport. An increased focus on air pollution mitigation measures, such as air filters in schools in areas with poor air quality. 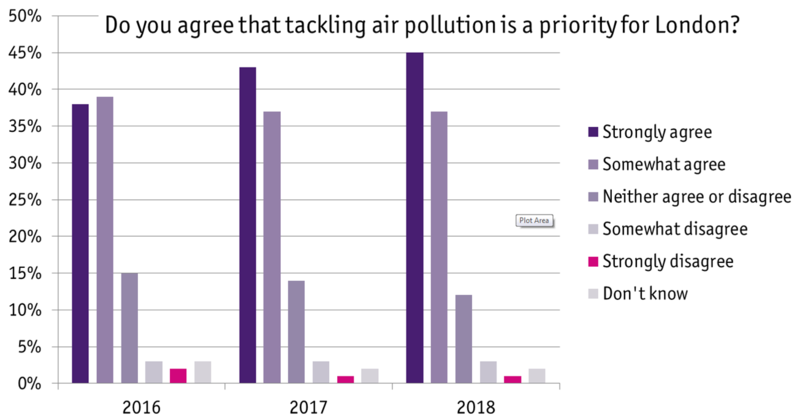 82% said that they agree tackling air pollution should be a priority, with 45% strongly agreeing (up from 38% in 2016). Over a third (39%) of Londoners felt that London’s air had got worse in the last 12 months – up from 31% in 2017. Over a quarter (26%) of those questioned said they felt unsafe cycling in London. Overall – there has been an increase in the proportion of people who say that air pollution influences their decisions in their day-to-day life. More people than ever say that air pollution affects their decision when picking schools for their children – 60% of those who have children say their decisions are affected by air pollution. To learn more about air pollution issues in London, you can view our report 'Demystifying Air Quality in London' here. What are the London boroughs doing for Clean Air Day 2018? Islington Council have put together an art competition with all primary school children to design a clean air poster. Winning posters will be made into postcards and given out for free in the borough's libraries. The posters will be displayed in an exhibition at Islington Museum, Central Library and at two different Clean Air Day events. The first event is in Archway, where there will be a pop up event on Navigator Square with Dr Bike, electric vehicle information and an idling event with full training for anyone who wants to learn how to talk to idlers. The second event is in Angel, between Goswell Road, City Road and Owen Street, where the Council will provide a free bikers’ breakfast to all who cycle past from 8am (until they run out of croissants!). Between 4pm – 7pm, there will be a pop-up event celebrating cleaner travel with Dr Bike, bike security tagging, fastest bike locking games and more. Islington Council will also launch their Clean Air Walk, a low pollution route between Kings Cross and Angel, with an inaugural walk by the Mayor at midday. An online map of all the cleaner air routes across Islington will also be released on their website. More widely Islington are working to tackle pollution in many ways. The Archway Zero Emission Neighbourhood (ZEN) programme and tri-borough CityFringe ZEN programme (with Hackney and Tower Hamlets) are helping local businesses and residents switch to electric travel where possible and helping more people onto and feeling safe on bikes. The Council holds anti-idling events with primary schools and with Idling Action London to help educate and bring awareness to idling, especially in relation to schools. Idlers in Islington can now be issued a £20 fine via our Compliance Team. Cleaner air walking maps and monitoring has also been provided for several schools to help them make healthier choices when travelling to and from school. The borough will hold a consultation in relation to School Streets, the programme for closing the streets outside primary schools during drop off and pick up times to encourage more walking and create a cleaner and safer environment for the students. There are over 130 pollution monitoring tubes across the borough, including at least one outside of every primary school and the data is analysed by Kings College London. National Clean Air Day is about raising awareness of pollution and health related issues and working together to improve local air quality. Wandsworth Council has a package of measures already in place to reduce air pollution and will be actively supporting Clean Air Day. The Council is supporting the Putney BID as they get out and about and invite residents to make pledges to do their bit to help reduce pollution. An event is being held in Tooting on Saturday 23rd to encourage people to leave their cars at home. Council officers will be in the town centre offering advice, handing out information leaflets and giving out goodies and a chance to ride a smoothie bike as this is a fun and engaging way to encourage active travel. A similar event will be held at a local hospital during the following week. There will also be a string of events in borough schools this month teaching young people about reducing air pollution. There will be workshops provided by theatre groups and games to teach children how we can all help to improve air quality. We will also be working with contractors in Nine Elms to help get the word out about Clean Air Day. Air quality in Nine Elms has improved dramatically recently thanks to close and effective working with the companies building the new homes, offices and shops. This close partnership will see the introduction of three new green living walls across the Nine Elms development area. Wandsworth is a member of the London Low Emission Construction Partnership (LLECP), working with other London boroughs and Kings College London to reduce the air quality impacts from building work. Several sites in Nine Elms have been working with the LLECP on dust and emission reduction trials and increasing their use of sustainable plant and machinery on site. Air pollution contributes to the equivalent of one in twenty deaths in Kingston upon Thames - and we all have a part to play in clearing the air. Friday 8th June: School Air Quality Ambassadors (SAQA). School children from around the borough who have been nominated as “Air Quality Ambassadors” have been invited into the Council Chamber to take part in an “Air Quality Lesson”, and will then be given the resources to take back to their schools to deliver the lesson on CAD. Thursday 21st June: CLEAN AIR DAY. Clean Air Day itself will see a number of activites taking place around the borough, including a pledge wall: Senior management team to pledge their action from the Air Quality Action Plan which will be videod prior to the day, ready for tweeting on 21st June. “Cloud” pledges hung in “Perky Blenders” cafe. A giant Snakes & Ladders game in reception Town Hall. And all staff are invited to sign up to a Snakes & Ladders tournament running throughout the day. AirText (re) launch. Leaflets. Engage with GPs, pharmacies, Public Health. An anti-idling campaign with Public Health.